If you've been reading my blog for a while or been to my smARTteacher account you'll already know that I do a warm up called the Quick Draw Challenge. Its a great way to help my students focus and get settled before a lesson. Since I'm in middle school now and I have these quick draws three times a week I've been running low ideas. So I asked my students to give suggestions for the quick draws and they've come up with some pretty awesome ones! I really love it now because I know that the kids are being active and participating in their creativity. 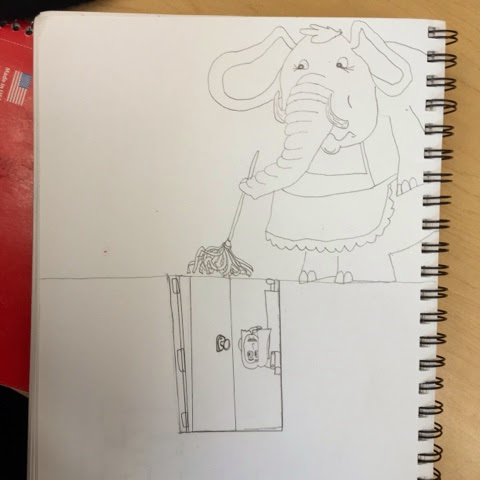 This comes from one of my students suggestions: You have an elephant maid, draw her doing your chores! Here is a students response to the above prompt. How do you get your students to focus at the beginning of class? I did my student teaching in a middle school and we used the book "Doodle Your Day" by Anita Wood almost every day for prompts. I don't think all of them are quite as creative as the above example, but you could at least use it as a starting point! Thank you so much for your suggestion! I'm already thinking about next year and how I won't be able to reuse the ones I've made this year!